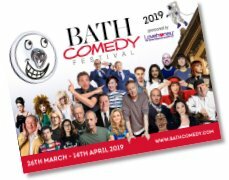 Browse Bath Comedy Festival events - click on the title of an event below for full details and booking information, including online booking links. Click to view all events on one long scrolling page. This symbol denotes events in the core programme, i.e. curated by the Festival. This symbol denotes "Pay-as-you-feel" events (you can buy advance tickets to secure a seat or pay what you want on the day). Read the printed Festival brochure online.. Printed brochures will be available from the end of February in many pubs, cafés and restaurants around Bath and surrounding areas, from all venues, the Polite Box and the Visitor Information Centre. Preview the brochure online. Pick up a copy of our glossy printed programme around town from late February or early March, or if you would like a copy posted to you, please send an A5 sized s.a.e. with two first class stamps affixed, to Bath Comedy Festival, Programme Request, 4a Sussex Place, Bath BA2 4LA (programmes will be posted by return). 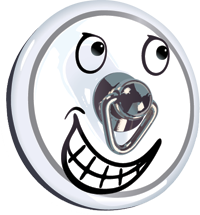 Details of 2019 Bath Comedy Special events will be posted here when they come on sale.